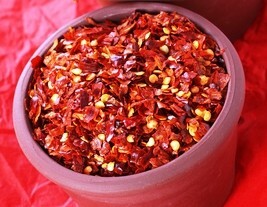 Since 2000BC chilli peppers have been part of the diets of Mayans and Aztecs in central Mexico and the Yucatan. The ancient Mayas and Aztecs used chillies as food and medicine and in religious rituals and ceremonies. Nowadays, they not only provide heat, but also flavour, colour and visual appeal to foods around the world. Chillis add flavour as well as heat to foods. They tend to enhance and add a background note for other spices and flavourings. Chilli Peppers are high in vitamin A and C. Red Chillies have more Vitamin A than carrots. They are low in calories and sodium and contain potassium, phosphorus, magnesium and folic acid. Our Chillies are quite hot and contain a mix of Gunter Chillies and Birdseye Chillies.